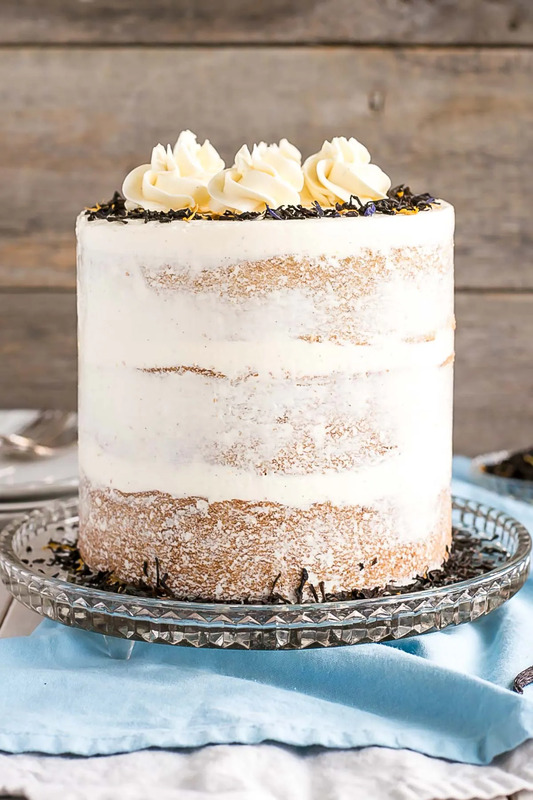 This Earl Grey Cake is perfect for the tea lover in your life! 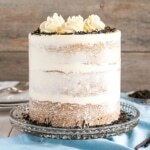 Earl Grey infused cake layers paired with a silky vanilla bean buttercream. There is nothing quite like having to call the fire department while you’re in the middle of making a cake. And no, this was not due to another incident with the kitchen torch. It actually had nothing to do with my baking at all (hah! ), but it certainly made for a more eventful Thursday than I had planned. It all started with an odd smell in the kitchen. I went in there late morning to start making the buttercream for this Earl Grey Cake and smelled this weird mechanical/chemical kinda smell (not gas). I thought maybe it was the landscapers with their various electric tool things (lol, I have no idea what they are called), but the smell didn’t dissipate after they left, and actually got stronger. In typical Olivia fashion, I started to freak out, half-finished cake still sitting on the counter. I have a pretty wild imagination so I started picturing faulty wiring in the walls, smoking and starting an electrical fire (for real). Our place is 30 years old (we’ve only been here for a year) and has had some work done to it. Some of the stuff here has been DIY’d, and I have no idea what’s inside the walls. Anyhow, due to fears of an electrical fire (lol, sigh), I went and turned off all of the breakers leading to anything in the kitchen. Sure enough, the smell faded away. This confirmed my fears that it was something electrical. So, naturally, I went to Google to see what to do. As always, Google is so helpful. No matter what you look up, you’re either dying or you’re going to die. Everything was like: “Get out of the house!”,”You’re gonna die!”, “Call the fire department”. So I did. I had to psych myself up to do it though. The thought of a fire truck outside my door, neighbors gawking and wondering wtf was going on, I just didn’t want to deal with it. But I also didn’t want out place to burn down, so… I literally had an internal pep talk before I dialled the number. Anyhow, the fire department arrives. I could hear their sirens as I was pacing the floor, wondering if somehow they could be discreet (lol). They checked stuff out as much as they could, using their heat sensor things, but couldn’t find anything. I was hoping they’d be like — ok, turn on each of the breakers one by one and we’ll see. Unfortunately, they said they weren’t qualified to assess that and that I’d need to call an electrician, but to leave all the breakers off. SIGH. At least I was assured that nothing was currently on fire? I guess? So off I go to Google again to find an electrician who can come TODAY. ASAP. I was cringing at the amount I would be charged for this emergency visit. I get off the phone with the guy, who says he’ll be here in a couple hours, and turn the breaker for the fridge back on because, HELLO, I have a cake in there. As soon as I get back upstairs I smell it again. It’s easy to get behind our fridge, so I pull it out and start smelling the outlet. LOL I am SUCH a freak/loser/whatever. I thought for sure it was coming from there, but then I hear a zap from the back of the fridge. Aha! My nose leads me to the bottom of the back of the fridge, where there is this grate, and that’s where the smell is coming from. Thank god. I was so relived it wasn’t something in the walls!! I cancelled the electrician (yay!). I didn’t realize at that point that the fridge had actually DIED. I thought it was just on its last legs and that we should probably look at buying one on the weekend. After the whole ordeal (and finishing this cake), I went into the freezer to get a popsicle (it was super hot that day). The popsicle was basically mush. Oh *&^%. The fridge is DEAD. Ooookay, so off I went to the appliance store (alone, Ryan was at work and the shop closes at 5:30pm, seriously) to buy one that day. Thankfully they had one they could deliver on Saturday, so it wouldn’t be too bad. We put what we could into our (already packed and very small) second fridge/freezer, but there was still a lot left in the fridge. It was keeping things cool-ish as it died, but by Saturday morning when we opened it up, the air that came out of there was warmer than the air outside. Gross. So, a bit of an ordeal and some food loss, but it all worked out in the end. And we finally have a new fridge, which I’ve wanted since the day we moved in. 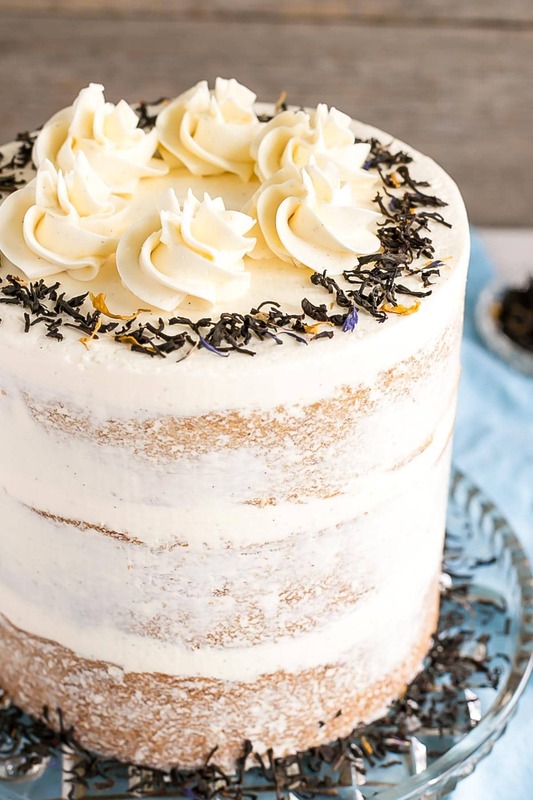 Now, let’s talk about this Earl Grey Cake, shall we? Because it’s a winner. I’d had an Earl Grey Cake on my radar for a while now, but it seemed like more of a “Fall” type cake (cozy sweaters, warm tea, etc. ), so I waited until it was closer to Fall season. The days are getting shorter and cooler (I’m actually wearing a sweater as I type this – insert happy face). Earl Grey is traditionally a black tea that is flavoured with bergamot (citrus). I say traditionally because you can now get rooibos and even green tea versions of Earl Grey. I prefer the traditional one, although mine has a bit of a twist too. My favourite is a Cream of Earl Grey which adds a hint of vanilla to the classic beverage. It really takes it to a whole ‘nother level of deliciousness. I used Cream of Earl Grey tea in the cake, but you can use any kind you like. You don’t have to love tea to love this cake! Ryan is not a tea drinker at all, and he loved the unique flavour it has — though I will say that if you are not a fan of Earl Grey, it might not be up your alley. 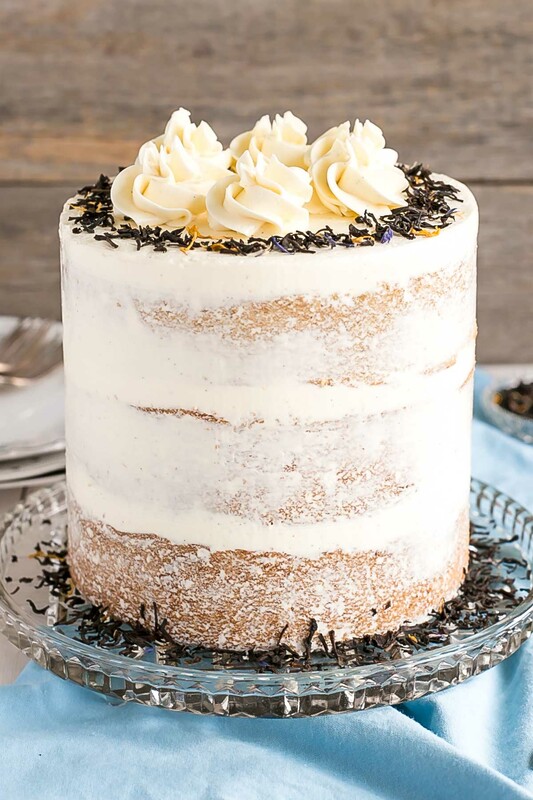 The Earl Grey tea is infused into the cake layers in many levels, so it is very prominent. 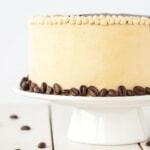 I paired it with a simple vanilla bean buttercream to compliment the creamy Earl Grey flavours. If you don’t like Earl Grey tea, you can experiment with other tea flavours. I used Cream of Earl Grey for this cake. The Earl Grey syrup is optional (I forgot to add it even though I had it made), but it will enhance the flavour of the cake even more, and will add moisture. I used the tea leaves as garnish on the cake for the pictures, but do not recommend doing this as they are rather unpleasant to chew on! Be sure to check my Swiss Meringue Buttercream post for tips and troubleshooting. 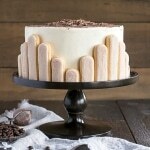 To help ensure your cake layers bake up nice and flat, see my Flat Top Cakes post. Bring milk and tea to a boil in a small pot over med-high heat. Turn heat off and steep for 10mins. Strain and measure out 1 cup. Top up with milk if needed. Preheat oven to 350F. Grease and flour three 6" cake rounds and line with parchment. In a medium bowl, whisk flour, baking powder, tea,and salt until well combined. Set aside. Using a stand mixer fitted with a paddle attachment, cream butter and sugar on med-high until pale and fluffy (approx 3mins). Reduce speed and add eggs one at a time fully incorporating after each addition. Add vanilla. Alternate adding flour mixture and Earl Grey milk, beginning and ending with flour (3 additions of flour and 2 of milk). Fully incorporating after each addition. Bake for approx. 35mins or until a toothpick inserted into the center comes out mostly clean. Place cakes on wire rack to cool for 10mins then turn out onto wire rack. Allow cakes to cool completely. Place sugar, water, and tea into a small pot. Bring to a boil and simmer 2 mins. Remove from heat, steep for 5 mins. Strain and cool completely. Place bowl over a double boiler on the stove and whisk constantly until the mixture is hot (160F) and no longer grainy to the touch (approx. 3mins). Place bowl on your stand mixer and whisk on med-high until the meringue is stiff and cooled (the bowl is no longer warm to the touch (approx. 5-10mins)). Switch to paddle attachment. Slowly add cubed butter and mix until smooth. ** Add vanilla bean paste and mix until incorporated. Place one layer of cake on a cake stand or serving plate. Brush with 2-3 Tbsp of the Earl Grey syrup. Top with approximately 2/3 cup of buttercream and spread evenly. Repeat with remaining layers. Frost and smooth the outside with a thin crumb coat. Chill for 20mins. * Ensure there is NO trace of egg yolks in your whites and that your mixer bowl and whisk is completely grease free or your meringue won't stiffen. ** The buttercream may look like it's curdled at some point. Keep mixing until it is completely smooth. *** I used tea leaves as garnish on the cake for the pictures, but do not recommend doing this as they are rather unpleasant to chew on! Hi, I was wondering what depth the pan should be? I’m seeing either 6” by 2” or 6” by 3”. Would the 6 by 2 be deep enough? Hi Sabrina! Either works but I used 2″ deep ones for this particular recipe. The cakes should bake close to the top of them. Not sure if this is covered somewhere (I tried to scroll through the comments but didn’t see an answer to this, so I’m sorry if this is a repeat question), but just wondering if it’s possible to just empty the contents of earlgrey teabags for this recipe or if loose leaf tea is necessary? Thanks in advance! Hi! My dad loves earl grey so I’m planning to make this for his birthday that’s coming up soon. I have 2 9” cake pans and was wondering if I should double the recipe or just do 1.5. What should I do? Thanks! I made this as cupcakes today and it was sooooo good! I also reduced all sugar by half and it was still sweet! I’m definitely going to make this again in the future. Hi Christina! So glad you liked it! I made this for my friend who loves earl grey tea and she LOVED it!! Thanks so much for the recipe! 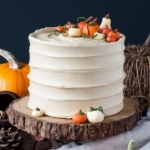 Wondering if I’d be able to tweak the buttercream and make it lemon buttercream? Hi Angela! So glad your friend liked it! And for sure — you can add some lemon zest and/or a bit of lemon juice to it. I’m making this cake for a birthday. I’m making it a day in advance and putting it together at the venue. I was only going to put the earl grey syrup on one layer – should i do this in advance or when assembling? Does it need to be warm for the syrup to soak in? Hi Sarah! I would do it when assembling. It does not need to be warm, but I would either trim the cakes or poke holes in them to make sure the syrup absorbs in. Hi! This cake looks fantastic! I was just wondering if I used a cake levelling strip to level my cake, will the sides of the cake become less interesting since it’s partially naked? Thanks again for the wonderful recipe. the cake tasted amazing and looked wonderful! Thank you so much. Just a question, what other frosting do you think I could use instead of the one you used in the recipe? I wasn’t too fond of this one, tho it was still amazing! Thanks again. Hi Jared! What didn’t you like about the frosting? It’s a pretty neutral flavour, but you can try an American buttercream if you prefer or a cream cheese frosting. I think both would go well! Omg, this cake is AMAZING. It’s sweet, but not too sweet, and it’s moist and very fragrant. Plus, I could eat just the bowl of frosting by myself lol. My dad doesn’t eat many sweets (I don’t even bother with a birthday cake anymore), but even he ate a hunk and said it was great! Hi Kelly! So happy that you liked it, and your dad too! This cake is absolutely delicious! Love the fragrance earl grey tea adds. Hello!! Baking this cake as we speak!!! Curious if the butter for the buttercream has to be cubed if it’s at room temp? Generally I only cube butter if it’s really cold – just don’t want to use warm butter if it’s supposed to be cold!!! Thanks for your help! Hi Jessica! It doesn’t need to be cubed as long as it’s already at room temp and you add it in about 1 Tbsp portions. I am a novice baker and have probably made less than 10 homemade cakes (thus far) in my life. 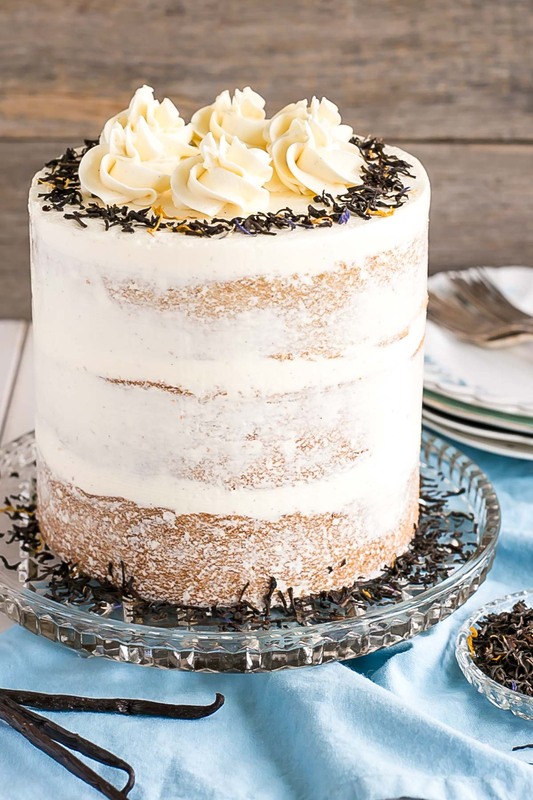 I am beginning to bake more and love a good London Fog so I thought an Earl Grey cake would be fun and found your recipe and blog. I read the directions over (and over and over 😂) to catch each detail since baking doesn’t come naturally to me yet. Your instructions were spot on and the cake turned out AMAZING! I made it for my supper club and it was a huge hit! I only have a hand mixer and it took quite a while to make the icing but it was worth it. Thank you for such well-written instructions, I plan to work my way through your recipes with my kiddos and am so excited! They love baking and baking shows and it will be so fun to learn together. Thank you again! Hi Angela! Thanks so much for the great feedback. I’m so glad you found everything easy to follow and that it turned out well! I can’t wait to hear what you’ll make next! This cake is absolutely tasty! I made this for my birthday just over the weekend with two layers of 8 inch round. My first time making layered cake with frosting!! I was so thrilled when it all came together. My family just loved it into pieces. The cake was so moist and Earl grey’y’!! Thank you for sharing, I am so glad that I came across your blog! Definitely will try your other cake recipes too! Hi Olivia! So happy to hear that you liked it and happy belated birthday! 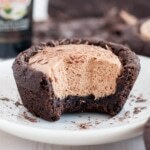 Hey, I love the look of this recipe and am making it tomorrow for a school project! Quick question, I want to scale this bad boy up a bit to feed the hungry masses, do you think doubling this recipe would give me three 9 inch rounds? Even if they are thinner than normal I can reduce bake time to probably 10 minutes less… what’re your thoughts? Hi Vishal! Sorry for the delayed reply, I hope it worked out ok! Doubling should have worked well for three 9″ rounds! Hi….this cake and all the reviews looks like one I really want to try. I did make your banana blueberry cake and had good comments about it. Thanks Liv! 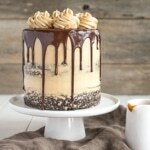 That recipe used cake flour, I’m wondering if I could use cake flour as well for this recipe ? Hi Jennifer! You could totally use cake flour here instead. Let me know how you like it! This is SUCH A GREAT RECIPE!! I made it for my sisters 22nd birthday this weekend and it was lovely. I added culinary grade lavender flowers to the milk, the batter, and the syrup and it was so aromatic and delicious. I probably used a half teaspoon of lavender at each phase. It turned out to be a great combination of flavors, and I plan to make this cake again. Thank you Olivia! So happy to hear that Madeline!! I love the addition of lavender, I’ll have to try that! 1) How do you get your tea ground so finely? I have been using a food processor but there are still sizeable chunks left. 2) What do you with the wet tea loose leaf after straining the milk tea? I hate the idea of throwing them out but I’m not sure what else I could use them for. Thought about using them for garnish but they are unpleasant to chew! Hello, I am so excited to make this recipe today!! Have you ever made cupcakes with this recipe?? What would the baking time be for the recipe? So excited to try this!! Thinking of doing a lavender honey buttercream with this, thoughts???? If I wanted to make a 3 layer 8 inch cake, should I double the recipe? Hi Mandy! Yes, double the recipe. Your layers will be slightly thinner so you may need to reduce the baking time a bit. My cake didn’t come out so moist. What do you think I did wrong? I had froze it for 40 minutes, frosted it and then let it come to room temperature for 3 hours. Hi Erica! Is it possible it was overbaked? Was it completely at room temperature when you ate it or still a bit cold? I just want to say, I was super impressed with this cake. I’m always looking for good cake recipes and usually have to change something about the recipe in order to get the cake to how I want it. Every part of this recipe was spot on. Perfection! Thank you! I made this cake (with a fig jam buttercream) yesterday and the cake came out wonderfully. 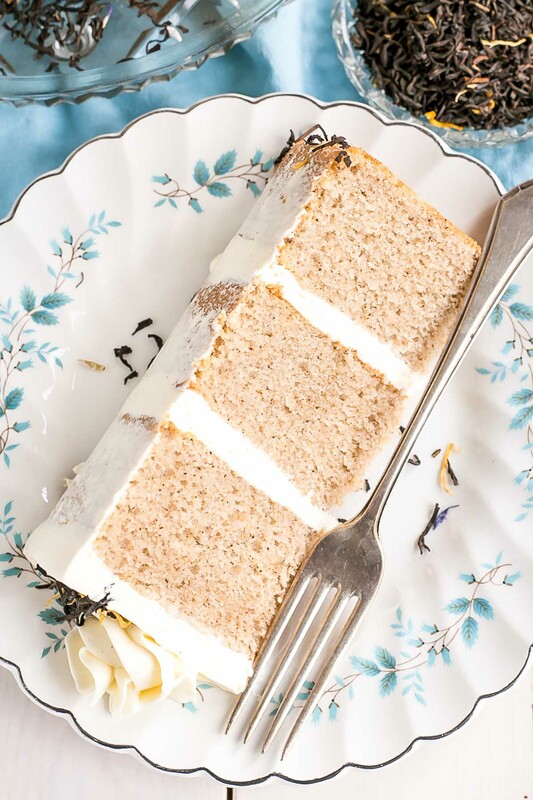 Delicately flavored but you can definitely taste the earl grey, moist, light… great recipe! So glad you liked it Katie! Hi there!! I’m in the midst of trying this recipe, and after making the Earl Grey Syrup, I realized there aren’t any further instructions beside how to make that. When do you add it? To the cake? In addition to the milk? And do you swap out something else (like some of the sugar)? Thanks for your help! Hi Lizzie! That step is listed as part of Assembly — you brush it onto the layers. Can I ask would you have a mascarpone cream/custard recipe? This cake looks amazing and I want to make it for my sister’s 40th but she isn’t a big fan of buttercream… Many thanks!! Thank you!! Thank you for the videos as well!! Hi Olivia! Thanks so much for this gorgeous recipe. I’m planning on trying it out this weekend! I was just wondering if you had a preference for a type of milk to use? I was going to try whole, but I didn’t know if that would be best. This cake was lovely! Made it for a baby shower and everyone loved it! Total hit. Thank you! I want to make this so bad! I was wondering if adding a hint of orange to the frosting would be good as the tea already has orange in it. Plus we have an orange tree in the yard that is producing a lot of oranges right now. Do you know if I could incorporate orange juice/zest in the frosting without messing it up? Hi Holly! I think that would be totally fine and perfectly delicious. I would use zest first — add it in after you finish adding the butter and give it a taste. If it needs more you can add some juice (1 Tbsp max) or more zest (as much as you like). Let me know how it turns out! I’m planning to make this cake for a dinner at friend’s house. What can I do if I can’t find any Earl Grey tea finely ground but only Earl Grey tea leaf (or like the Lipton/twinnings tea bag)? Hi Mai! Do you have a spice grinder? Or something you could grin the tea leaves up with? Hi Mai! I would love to see your pictures! Send them to livforcakeblog[at]gmail[dot]com. Hi Olivia! I’m planning on making this cake this weekend for a friends birthday. What would you suggest as decorations/topping/garnish instead if not the earl grey tea leaves? P.S. I’ve been following your recipes for a while now and absolutely love them. My goal one day is to make all of yours :)…5 down, lots to go! Hi Sharon! Can I just say how flattered I am that you’re working your way through my recipes?! Amazing. Thank you! I hope you like them all :). For garnish, if you could find some edible flowers, that would be super pretty, though those might be hard to come by, especially this time of year. You could use sprigs of thyme, that always looks pretty too, and just remove them before serving (easier to remove than the tea leaves, hah). If you wanted to get a bit fancy, you could do a white chocolate ganache drip and color it lavender, or something like that (the ratios for that are different than a dark choco ganache, so let me know if oyu want to go that route and I’ll give you the proportions). If the ganache is too thick, add in a tsp of heavy cream until it gets to a thin enough consistency. Let me know how it turns out! Ahhh also I had one more question – sorry I’m asking so late, hopefully you see it before tomorrow (when I’m baking this). 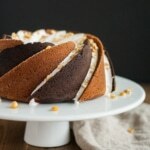 I found another recipe for an earl grey buttercream as well (https://www.abeautifulplate.com/london-fog-cake-earl-grey-buttercream/) – do you think that would go well with the cake? 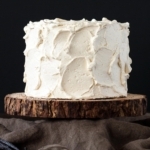 Or do you think the cake itself has enough earl grey flavor and adding this buttercream would be overpowering? Finished! It turned out great :). Using earl grey buttercream definitely helped intensify the flavor and luckily people didn’t think it was overpowering. Would definitely recommend! I ended up doing a simple swirl topping, did not brave the ganache haha. I can send pictures if you want! Hi! This cake looks amazing! Would I be able to use a vanilla bean or extract opposed to vanilla bean paste? Hi Erin! Sure thing, those would work just fine. Hi What size cake pan is the recipe for? 6″? Hi Sofie! Yes, 6″ pans. thank you! If I double for an 8″, will it be too much? You can use the recipe as is for two 8″ or 1.5x the recipe for three 8″ pans. I hope that helps! 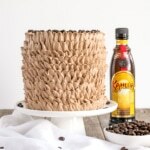 Would this cake recipe be ok to use for cupcakes instead of a full cake? What would you suggest for temperature and cooking time? Hi Stephanie! You can totally use it for cupcakes. Bake at the same temperature, but check them after 15mins or so as they may be done by then. 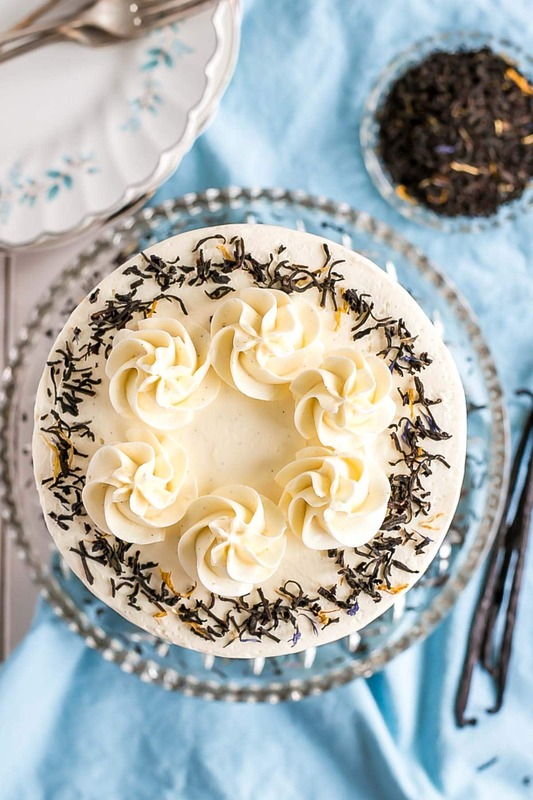 Do you think this earl grey cake will pair well with a honey cream cheese frosting? Or will it taste funny? I do not like to use powder sugar for my cakes, and I’ve been repeatedly using honey, cream cheese, and unsalted butter as my frosting. Since this is an earl grey tea cake flavor, I’m afraid the flavor will not pair well. What do you think? Hi Emily! I actually think it would go really well. Especially with the honey. Honey is often an addition to Earl Grey tea! At least over here 🙂 I’m not 100% sure on the cream cheese, but I think it would be fine. I haven’t had a cake yet that didn’t work with a cream cheese frosting 🙂 Let me know how it turns out! The cream cheese frosting unfortunately didn’t work well with this cake, covered up all the earl grey taste. However, my cake came out really dense, I was wondering if it was anything I did wrong, because your cake look so fluffy. Hi Emily! Sorry to hear you the cream cheese didn’t work out. Regarding the dense cake — did it rise ok? If not, perhaps your baking powder is expired. Another culprit could be overmixing the batter! Only mix the flour until just incorporated at each stage. How do you get such a clean edge and even colour on the sides of your cake? I tried the cake and I absolutely love it! It was very moist and had a great flavor. Thank you very much for the great recipe!!!! Do you think I can add earl grey oil to enhance the flavor? Hi Stephanie! I’ve never used earl grey oil, but I can’t see it being a problem. Be careful with the strength of it though, if it’s concentrated. 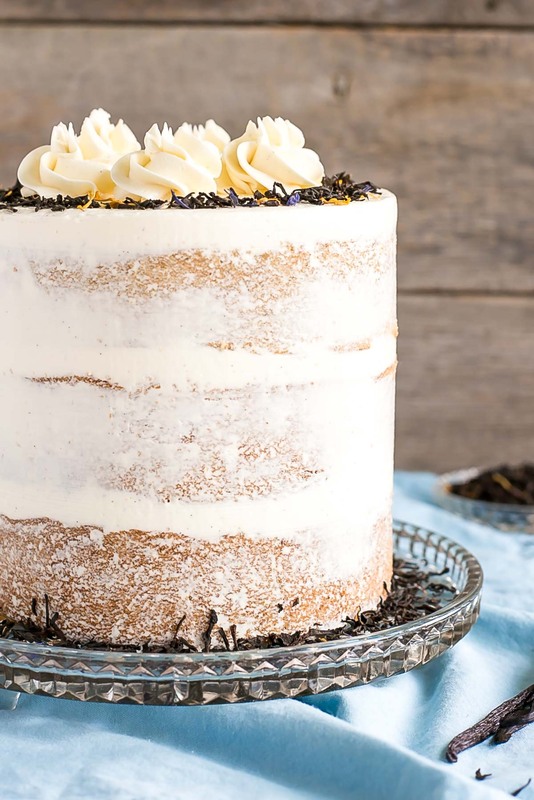 This cake is already packed with Earl Grey flavour! Your story is my life! I am probably the most dramatic person (according to my husband) and I would have called the cops in a heartbeat, and yeah, my mind races so fast, I’ve already thought of about a dozen scenarios of my death from some minuscule happening. But I’m so glad it was just the fridge and yay for getting new appliances! I’ve seen a variation of earl grey cake all over the place and I tell myself I want to try it, but I actually don’t like earl grey. LOVE tea, but am not a fan of earl grey. I wonder if it will have a different taste, or maybe a more subtle taste? Hmm. Might experiment anyway since my husband loves earl grey. I’m so glad it was just the fridge and not something super complicated! And I’m excited about this Earl Grey Cake! I basically dream of turning every dessert into a London Fog (aka Earl Grey Tea Latte), so basically you made my dreams come true!